By Emily Janitz, D.O., Lena Naffaa, M.D., Michael Rubin, M.D., S. Srinivas Ganapathy, M.D. Appendicitis is a common diagnostic consideration in all patients presenting with abdominal pain; however, it remains of particular concern in children. Appendicitis is the most common pediatric surgical emergency,1 occurring in 7% of healthy children.2 With the need to make an appropriate diagnosis expeditiously and preferably without ionizing radiation, ultrasound is the ideal modality. 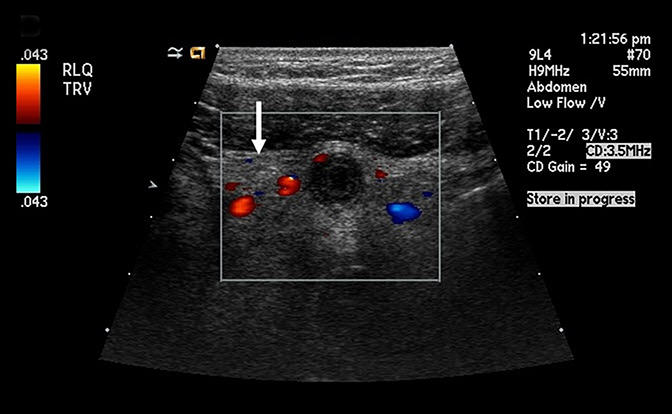 However, identifying the appendix remains a challenge sonographically with a wide range of rates of identification reported, as well as variable experience among technologists and radiologists in recognizing the appendix on ultrasound. 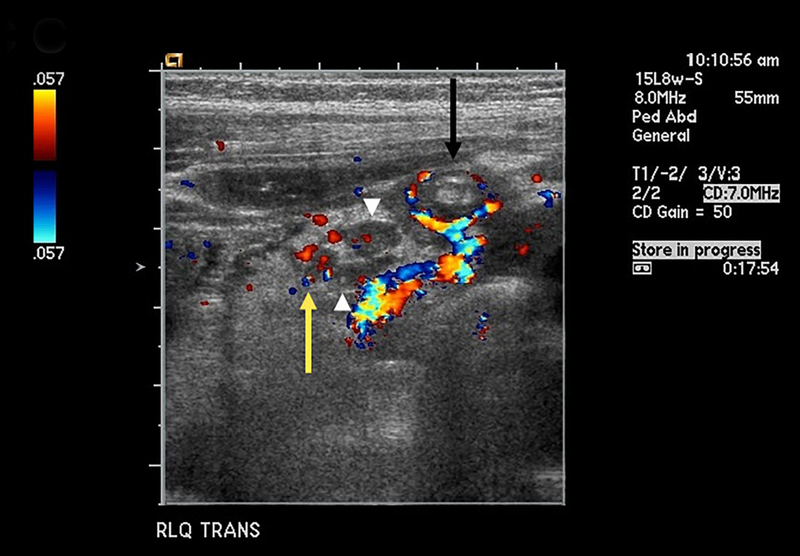 Familiarity of radiologists with optimal sonographic technique, imaging findings, and differential diagnoses is essential in accurately performing and interpreting these examinations. In another study analyzing ultrasound and CT for pediatric appendicitis, sensitivities varied between the modalities. 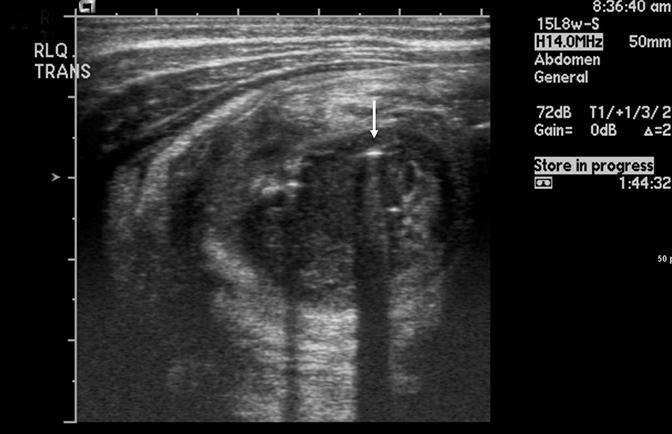 This study assumed that a nonvisualized appendix on ultrasound was a negative exam for appendicitis. CT showed a sensitivity of 95%, specificity of 93%, and accuracy of 94% for appendicitis. Ultrasound had a lower sensitivity of 78%, equal specificity of 93%, and accuracy of 89%. However, when the patient population was further divided (younger or older than 10 years), the significant difference in sensitivities were in the older age group.1 The sensitivity between the 2 modalities was similar in patients < 10 years old. Initially the ascending colon should be identified as a nonperistalsing structure with haustrations along the right lateral abdomen. 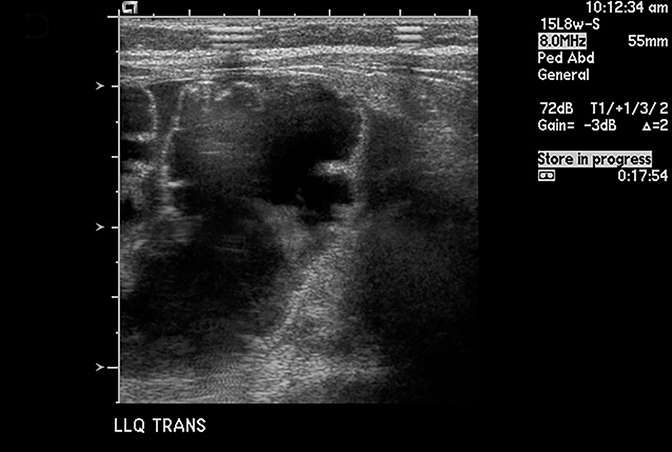 The probe is then moved inferiorly to localize the terminal ileum (TI). The TI is smaller than the colon, compressible, and lacks haustrations and peristalses. The appendix arises from the cecum 10-20 mm inferior to the TI.8,9 The iliac vessels and psoas muscle can be used as landmarks, as most appendices are anterior to these structures. The 2 most common locations of the appendix are retroileal (53%) and subcecal (33%).10 Images should be obtained in transverse and longitudinal planes. 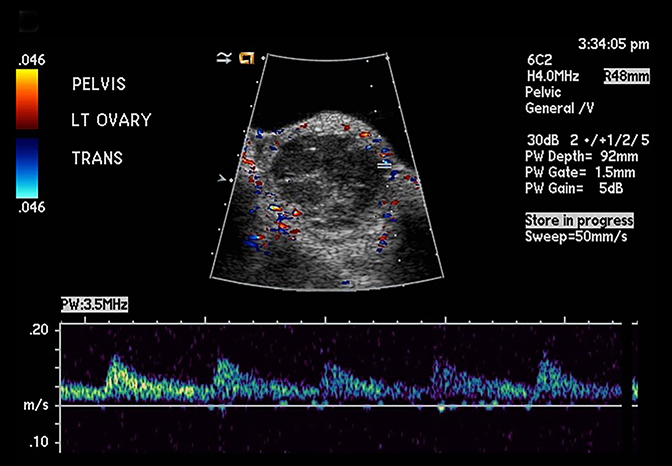 Gray-scale images, with and without compression, and color Doppler images should be acquired. A sweep through the pelvis is recommended as part of routine examination to look for potential complications (eg, free fluid or abscess). 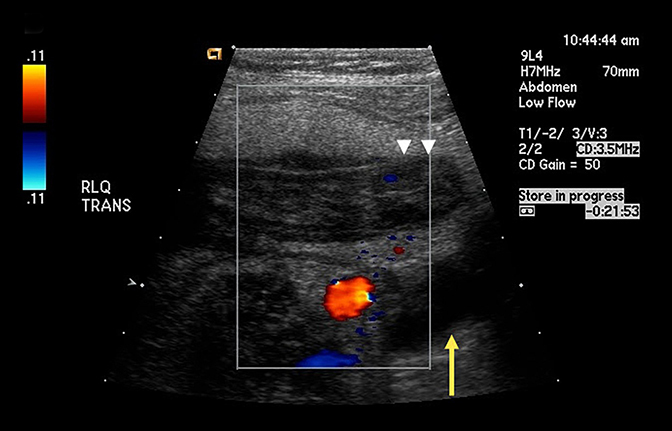 One should consider graded compression evaluation up to the liver tip and toward the midline, as the appendix can be found more superior and medial than expected. 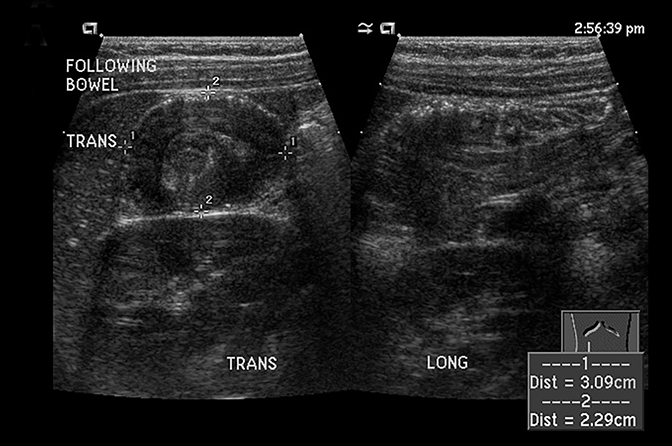 It is also helpful to assess for free fluid in Morrison’s pouch. 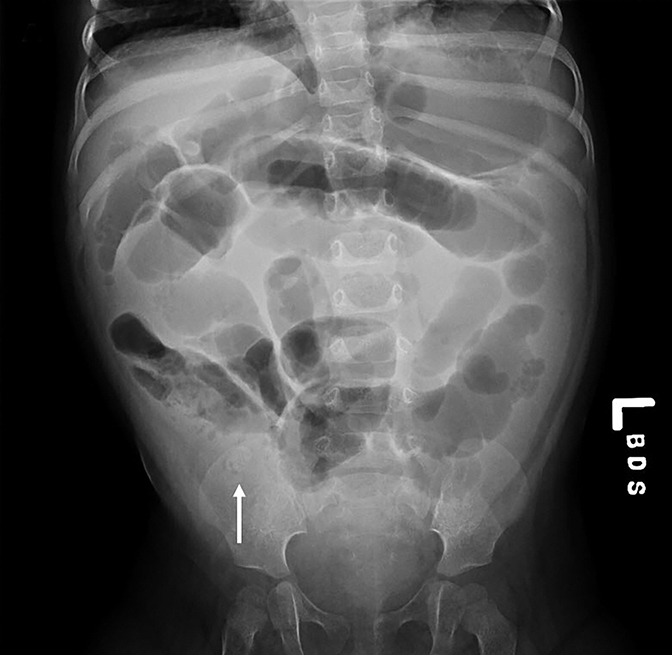 The appendix is a blind-ending tubular structure with readily identifiable concentric, alternating hyper and hypoechoic layers of the wall (bowel wall signature). The lumen is often filled with air. It arises from the inferior pole of the cecum. The appendix has a top normal diameter of 6 mm in short axis. An average appendiceal diameter of 4.2 mm (+/- 0.9 mm) was found in normal pediatric appendices.12 A normal appendix should show compressibility, often to near obliteration. There is little to no blood flow in the wall (Figures 4 and 5). 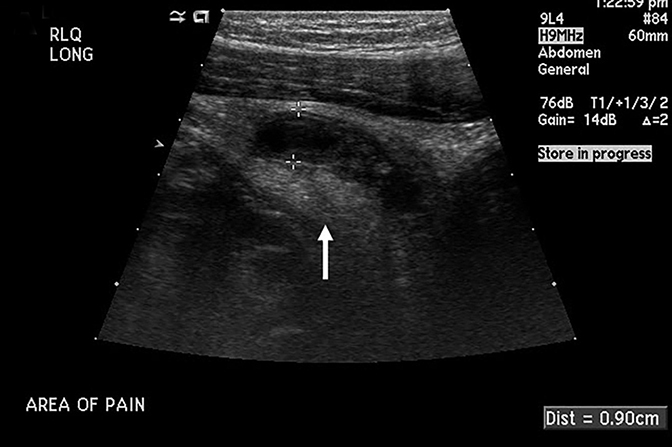 Many reports have shown that the absence of secondary signs with or without direct visualization of the normal appendix can exclude the diagnosis of acute appendicitis.16 If ultrasound does not identify the appendix or any secondary signs of inflammation, the rate of appendicitis has been reported as 5.8% to 7.1% in one study.17 However, Trout et al had a 33% rate of false negative exams in their study, most of which were in patients with a nonvisualized appendix and no secondary signs.6 Thus, one must be cautious, exercise clinical judgement, and be judicious with the use of CT in patients without visualization of the appendix and lack of secondary signs, especially when the person performing the exam has little experience and/or there is high clinical suspicion. 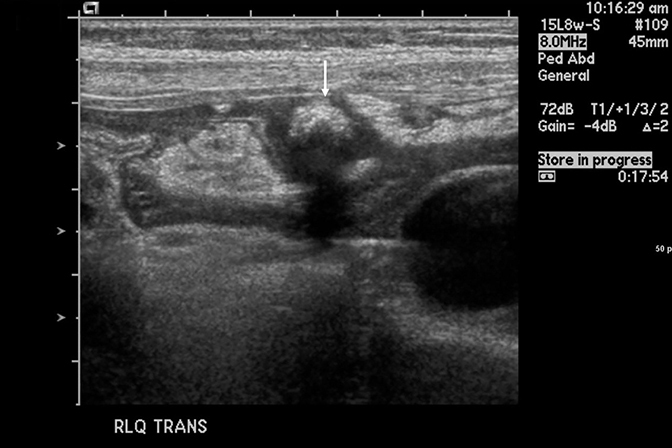 Not only is sonographic evaluation of the RLQ a technical challenge, it is also a diagnostic challenge given the spectrum of gastrointestinal (GI) and genitourinary pathologies that can mimic the clinical and imaging findings of acute appendicitis in children. The most common alternative diagnosis in pediatric patients imaged for acute appendicitis is mesenteric adenitis.21,22 Mesenteric adenitis is inflammation of lymph nodes often due to a viral infection.22 Findings in mesenteric adenitis include borderline to mildly enlarged (> 5 mm short axis), clustered mesenteric lymph nodes (> 3, Figure 12). Enlarged mesenteric lymph nodes are nonspecific, however, and can be seen in reactive, inflammatory, and infectious causes.4 This often remains a diagnosis of exclusion. Acute right pyelonephritis can present similar to appendicitis. 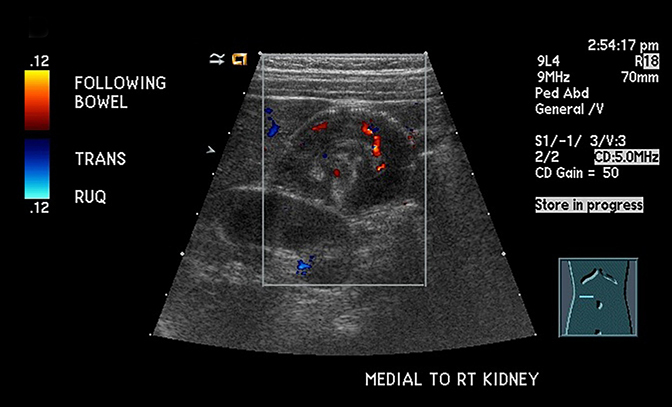 The kidney can have a variable sonographic appearance from normal to focal or global enlargement and varied echogenicity.4,21 Urolithiasis can also overlap with acute appendicitis.21 Hematuria helps make a determination clinically in the setting of urolithiasis. 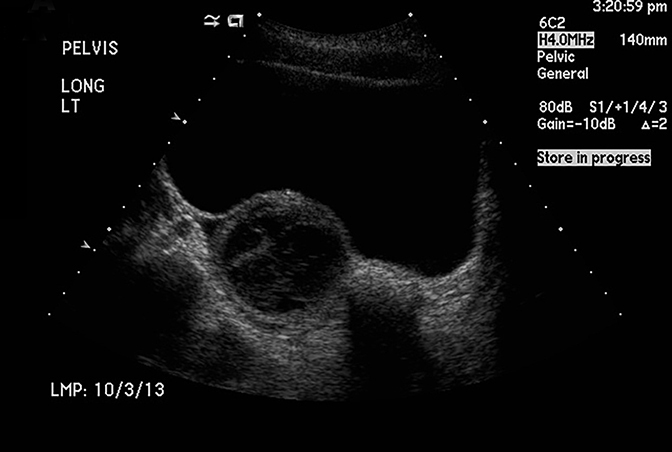 If a shadowing hyperechoic stone is seen in the ureter, then the sonogram can solve the dilemma. Malignant neoplasms of the appendix are found in an estimated 0.9-1.4% of specimens with carcinoid tumors being the most common. The presentation is often similar to that of acute appendicitis, and tumor is an uncommon preoperative diagnosis.14,28 Non-Hodgkin’s lymphoma (usually Burkitt type) can involve the ileocecal region and appendix. Often there is more extensive bowel wall thickening, which can rapidly worsen in a matter of days. Mucoceles are also rare with pathology ranging from benign (simple mucocele) to malignant (mucinous cystadenoma or mucinous cystadenocarnioma). Precautions when performing appendectomy in such cases are taken due to the risk of recurrence and pseudomyxoma peritoneii; however, it is rare to suspect this diagnosis preoperatively.14 Mucocele will often appear as a fluid-filled appendix on ultrasound. The ongoing challenge of identifying the appendix on ultrasound needs to be addressed in all practices. It is well-documented that visualizing the appendix on ultrasound greatly decreases the false-negative rate of the exam. Given the largely operator-dependent outcomes for visualizing the appendix, it is prudent that radiologists are actively involved with scanning, education, and oversight of these exams, especially in the pediatric population. Radiologists must also be aware of findings associated with both a normal and inflamed appendix, as well as appropriate differential diagnoses. Sivit CJ, Applegate KE, Stallion A, et al. Imaging evaluation of suspected appendicitis in a pediatric population: effectiveness of sonography versus CT. Am J Roentgenol 2000;175(4):977-980. Lardenoye SW, Puylaert JB, Smit MJ, et al. Appendix in children with cystic fibrosis: US features. Radiology 2004;232(1):187-189. Kessler N, Cyteval C, Gallix B, et al. 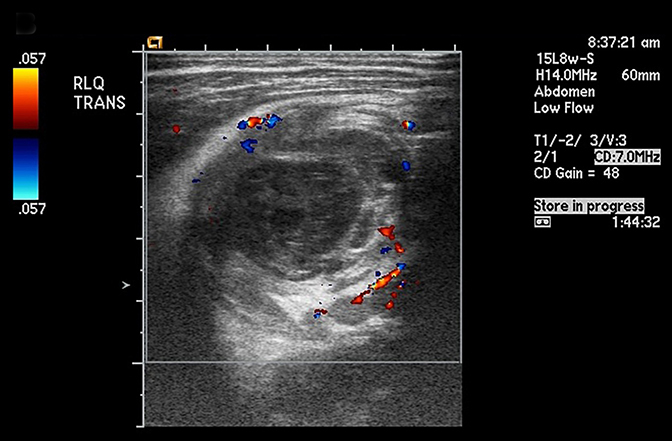 Appendicitis: evaluation of sensitivity, specificity, and predictive values of US, Doppler US, and laboratory findings. Radiology 2004;230(2):472-478. Siegel, M, Gastrointestinal Tract. In: Siegel, M, Pediatric Sonography 4th ed. Philadelphia, PA: Lippincott Williams & Wilkins 2011:339-383. Doria AS, Moineddin R, Kellenberger CJ, et al. US or CT for diagnosis of appendicitis in children and adults? A meta-analysis. Radiology 2006;241(1):83-94. Trout AT, Sanchez R, Ladino-Torres MF, et al. 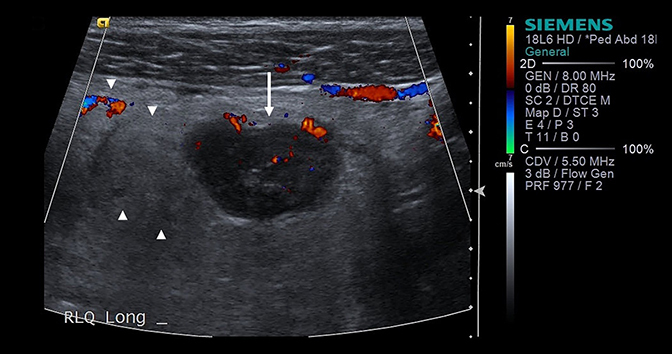 A critical evaluation of US for the diagnosis of pediatric acute appendicitis in a real-life setting: how can we improve the diagnostic value of sonography? Pediatr Radiol 2012;42:813-823. 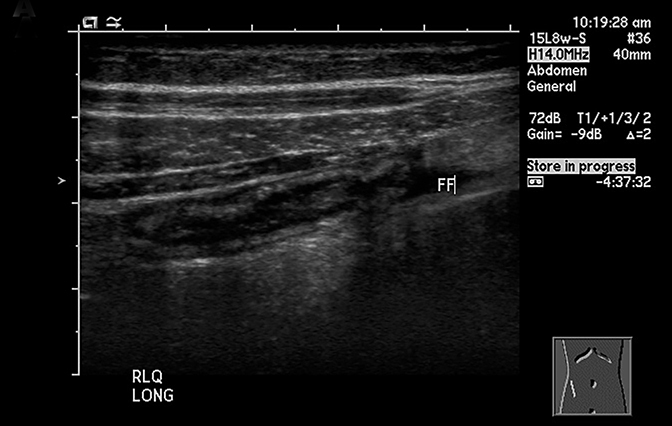 Puylaert J, Acute Appendicitis: US Evaluation Using Graded Compression. Radiology 1986;158:355-360. Sivit CJ, Siegel MJ, Applegate KE, et al. Special Focus Session. When appendicitis is suspected in children. Radiographics 2001;21(1):247-262. Sivit CJ, Applegate KE. Imaging of Acute Appendicitis in Children. 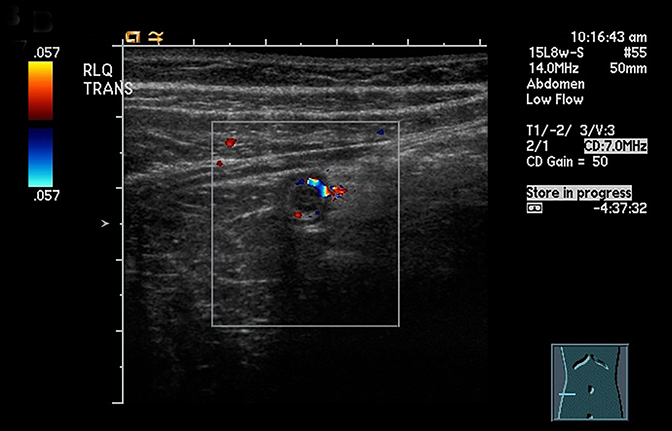 Semin Ultrasound CT MR 2003;24(2):74-82. Lee JH, Jeong YK, Hwang JC, et al. 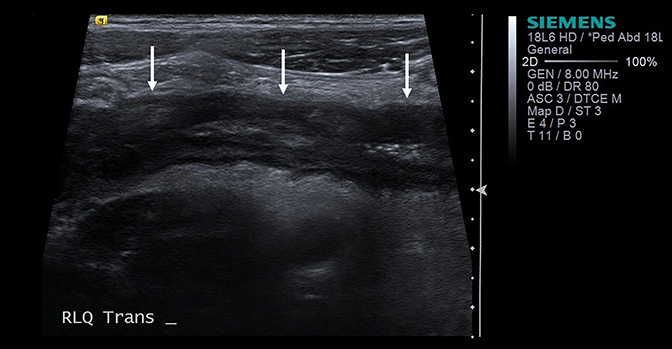 Graded compression sonography with adjuvant use of a posterior manual compression technique in the sonographic diagnosis of acute appendicitis. Am J Roentgenol 2002;178(4):863-868. Lee JH, Jeong YK, Park KB, et al. 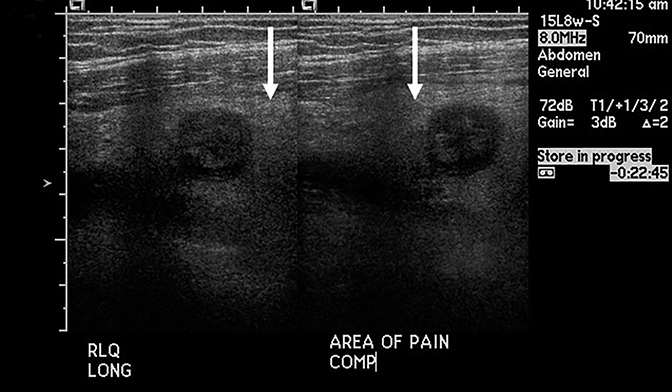 Operator-dependent techniques for Graded compression sonography to detect the appendix and diagnose acute appendicitis. Am J Roentgenol 2005;184:91-97. Ozel, A, Orhan UP, Akdana B, et al. 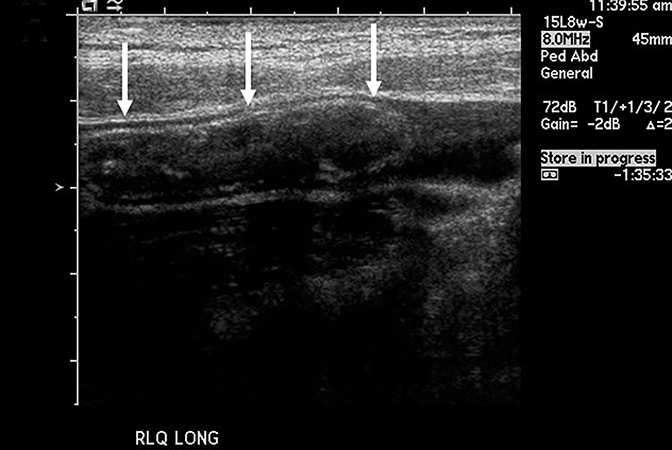 Sonographic appearance of the normal appendix in children. 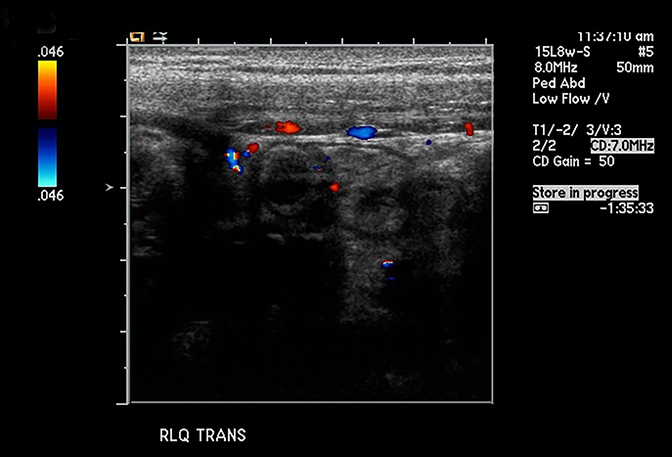 J Clin Ultrasound 2011;39:183-186. Tulin-Silver S, Babb J, Pinkney L, et al. The challenging ultrasound diagnosis of perforated appendicitisin children: constellations of sonographic findings improve specificity. Pediatr Radiol 2014 December 4; epub ahead of print. DOI 10.1007/s00247-014-3232-5. Dietz KR, Merrow AC, Podberesky DJ, et al. Beyond acute appendicitis: imaging of additional pathologies of the pediatric appendix, Pediatr Radiol 2013;43:232-242. Blumfield E, Nayak G, Srinivasan R, et al. 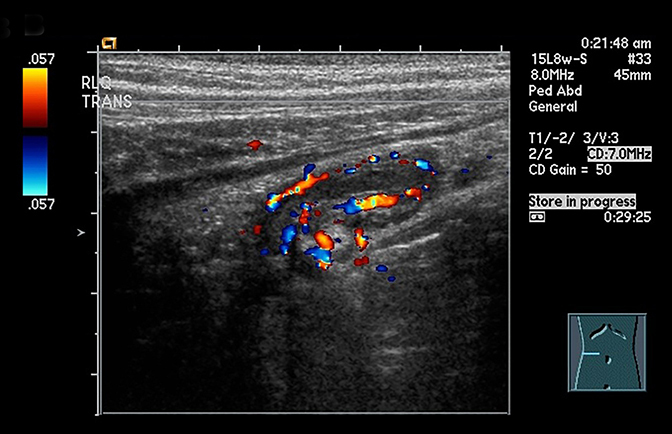 Ultrasound for differentiation between perforated and nonperforated appendicitis in pediatric patients. Am J Roentgenol 2013;200:957-962. Wiersma F, Toorenvliet BR, Bloem JL, et al. 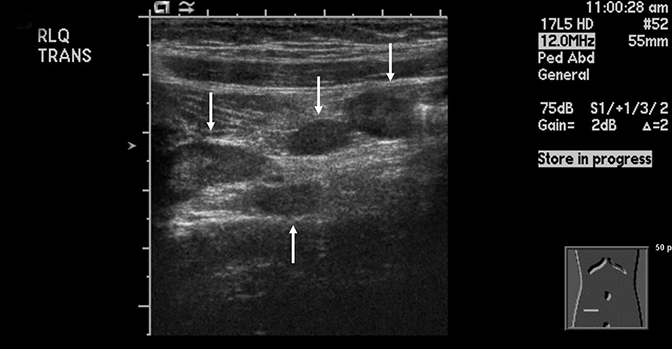 US examination of the appendix in children with suspected appendicitis: the additional value of secondary signs. Eur Radiol 2009;19:455-461. Kim SH, Choi YH, Kim WS, et al. 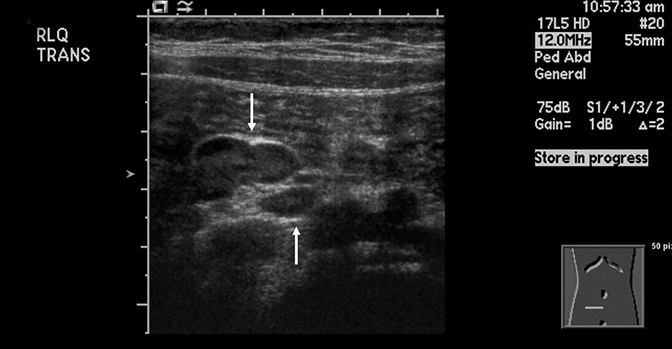 Acute appendicitis in children: ultrasound and CT findings in negative appendectomy cases. Pediatr Radiol 2014;44:1243-1251. 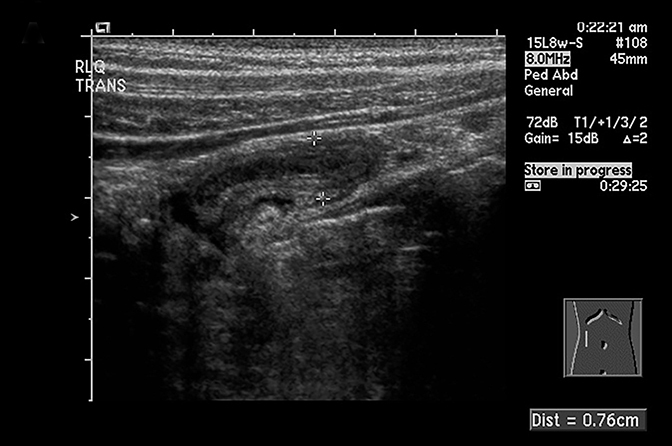 Hormann M, Scharitzer M, Stadler A, Ultrasound of the appendix in children: is the child too obese? Eur Radiol 2003;13:1428-1431. 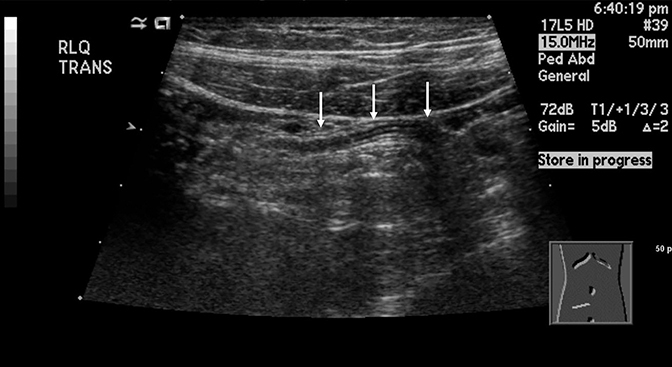 Josephson T, Styrud J, Eriksson S. Ultrasonography in acute appendicitis. Body mass index as selection factor for US examination. Acta Radiol 2000;41(5):486-488. Sung T, Callahan MJ, Taylor GA. Clinical and imaging mimickers of acute appendicitis in the pediatric population. Am J Roentgenol 2006;186(1):67-74. Carty HM. Paediatric emergencies: non-traumatic abdominal emergencies. Eur Radiol 2002;12(12):2835-2848. Garel L, Dubois J, Grignon A, et al. US of the pediatric female pelvis: a clinical perspective. Radiographics 2001;21(6):1393-1407. Linam LE, Darolia R, Naffaa L, et al. US findings of adnexal torsion in children and adolescents: size really does matter. Pediatr Radiol 2007;37(10): 1013-1019. Pomeranz AJ, Sabnis S. Misdiagnoses of ovarian masses in children and adolescents. Pediatr Emerg Care 2004;20(3):172-174. Baldisserotto M, Maffazzoni DR, Dora MD. Sonographic findings of Meckel’s diverticulitis in children. Am J Roentgenol 2003;180(2):425-428. Meyers AB, Deshmukh T, Boyd, KP. Comments and question regarding ‘Beyond acute appendicitis: imaging of additional pathologies of the pediatric appendix.’ Pediatr Radiol 2013;43:1053-1054. O’Donnell ME, Carson J, Garstin WI. Surgical treatment of malignant carcinoid tumours of the appendix. Int J Clin Pract 2007;61(3):431-437. Lamps LW. Infectious causes of appendicitis. Infect Dis Clin North Am 2010;24(4):995-1018. Janitz E, Naffaa L, Rubin M, Ganapathy SS. Ultrasound Evaluation for Appendicitis Focus on the Pediatric Population: A Review of the Literature. J Am Osteopath Coll Radiol. 2016;5(1):5-14. Emily Janitz, D.O., Lena Naffaa, M.D., Michael Rubin, M.D., S. Srinivas Ganapathy, M.D. Dr. Janitz, Dr. Naffaa, Dr. Rubin, and Dr. Ganapathy work with the Department of Radiology at Akron Children’s Hospital in Akron, OH.